파리, 프랑스의 호텔 마리냥 | 호스텔월드에서 예약하세요. 3 minutes walk to La Sorbonne, 5 minutes to Notre Dame and walking distance to The Louvre, Musee d'Orsay, Tuilleries Gardens, & The Marais. - a free laundry for guests including washer, dryer and laundry liquid! Guest rooms are bright, clean and comfortable with a range of comforts from private shower & toilet in the room to shared shower & toilet on the same floor. 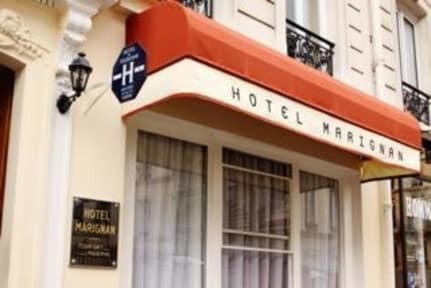 With rooms for 1 to 4 people, Hotel Marignan has been recently renovated in 2011. Staff are multi-lingual and happy to help with advice and assistance. With a Metro Station just 100 m away, guests have easy access to all of Paris. Public parking is available close-by. - travelers cheques (euros only) and cheque banks located in France. 친구가 이호텔에서 걸어서 5분거리에있는 호텔 훨씬더 싸게예약해서 가보고 비교해봤는데 침대도 크고 매일 수건도 새거로 4개씩주고 휴지도줬는데 이 호텔은 세탁기하고 건조기 무료로사용할수있는거 말고는 그 호텔에비해서 다 떨어지더라구요. 방안에 화장지도없고, 수건도 안갈아주고, 화장실도 방밖에있고 한층 사람들이 다같이 공용으로 사용하고 잠깐 가는건데도 방열쇠 꼇다뺏다 반복하 귀찮아죽는줄알았습니다. 엘리베이터도 없어서 20키로넘는 캐리어들고 오르고 내려가는데 힘들기도하고(힘좋은 성인남자 기준입니다^^) 계단이좁아 캐리어가 계속 부딪혀서 캐리어도기스가고 그리고 방도 상당히 작았습니다. 주변에 호텔이 진짜많았는데 평점이 괜찮아서 많이 안알아보고 예약했다가 진짜 후회많이했습니다. 주변에 호텔많고 시설,서비스좋은곳 많이있습니다. 후회없는 파리를 위해서 더알아보세요.